Today’s update looks briefly at recent news items that highlight current information on farmland values. In addition, key parts of a recent Wall Street Journal article that focused on the importance of off-farm income to U.S. farm households are also included. 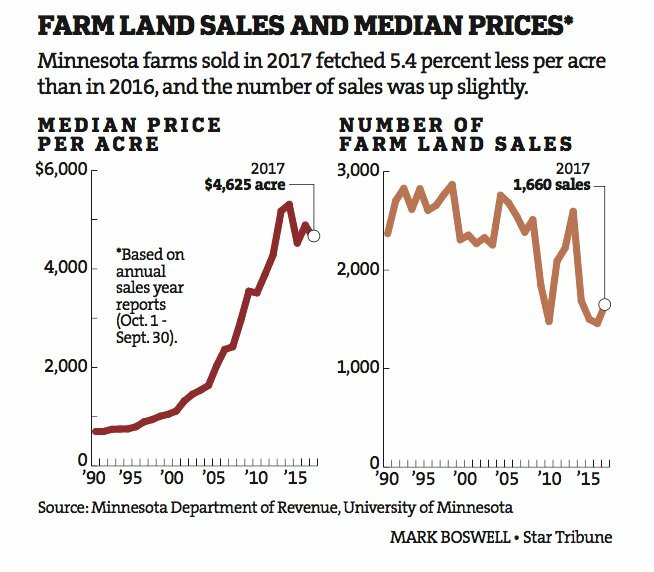 In a front page article last week in the Minneapolis Star Tribune, Tom Meersman reported that, “Prices for farmland declined across Minnesota in 2017, another sign of a weak farm economy that’s been plagued by low crop prices and reduced incomes for the past four years. 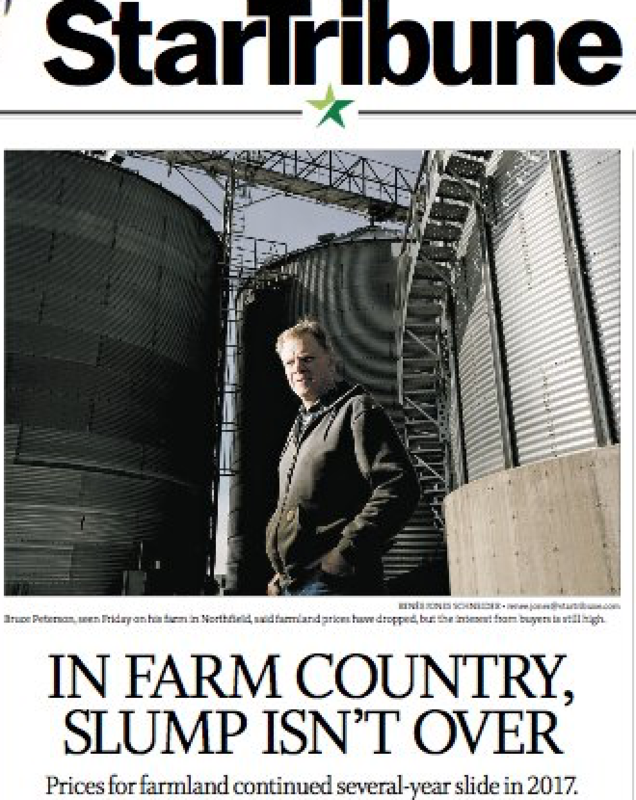 “In Farm Country, Slump Isn’t Over,” by Tom Meersman. Minneapolis Star Tribune front page (March 12, 2018). 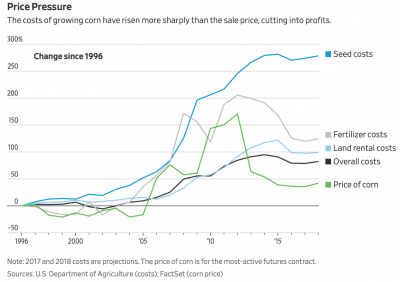 “Experts say many farmers are dealing with land values about 20 percent lower than when the market peaked in about 2012, when commodity prices were historically high. 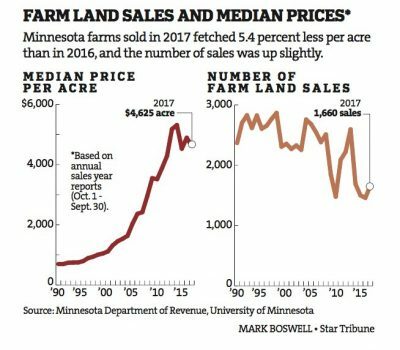 For 2017, numbers based on fiscal year sales data reported to the Minnesota Department of Revenue and analyzed by the University of Minnesota showed that the median price per acre of farmland was $4,625, down 5.4 percent from the previous year. 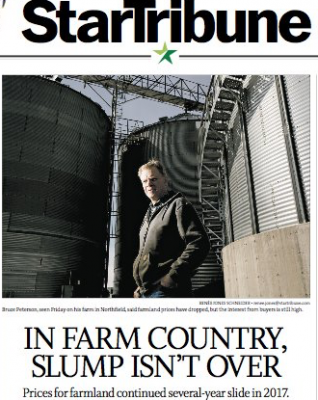 The Star Tribune article noted that, “Last week the Federal Reserve Bank of Minneapolis reported that the agricultural sector in Minnesota and nearby states remains weak but stable. Lenders responding to a January Fed survey of agricultural credit conditions indicated that farm income and capital spending decreased compared to the previous year, with further declines expected for the coming three months. 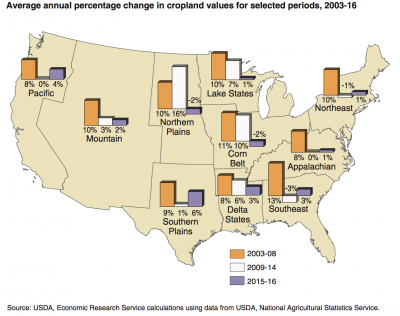 “In 2003-08, cropland appreciated almost uniformly across the regions. However, in 2009-14, cropland appreciation was mostly concentrated in four regions: the Northern Plains, Corn Belt, Lake States, and Delta States. This was largely due to increases in commodity prices for grain and oilseed crops.” Farmland Values, Land Ownership, and Returns to Farmland, 2000-2016, ERR-245. USDA, Economic Research Service (February 21, 2018). Meanwhile, DTN writer Todd Neeley reported late last week that, “Average Nebraska agriculture land values declined for a fourth-consecutive year, according to preliminary results of a University of Nebraska-Lincoln survey released on Thursday. “The survey of land professionals that included appraisers, farm and ranch managers and agricultural bankers, points to low commodity prices and state property tax issues as the reasons for the continued fall. “UNL found average agricultural land values declined by 3% in the past year, and by 17% since reaching an average high of $3,315 per acre in 2014. The latest survey found Nebraska all-land average values as of Feb. 1 averaged $2,745 per acre. 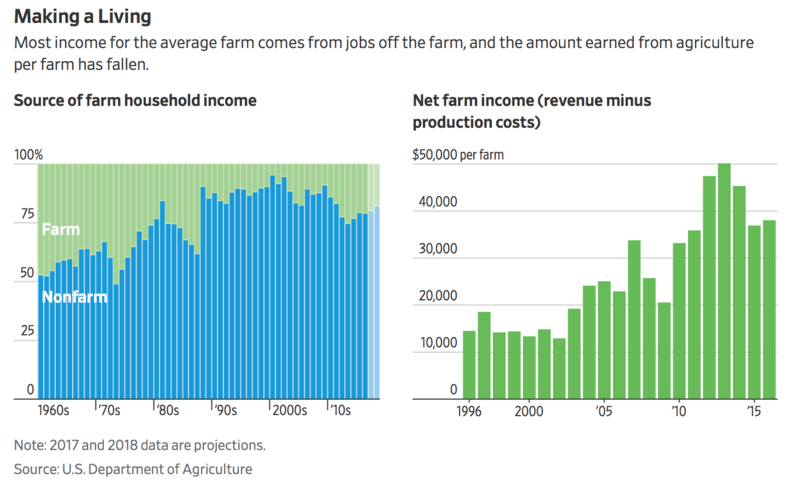 “To Stay on the Land, American Farmers Add Extra Jobs,” by Jacob Bunge and Jesse Newman. The Wall Street Journal Online (February 25, 2018). “Off-farm work has become more important since a slump in prices for corn, wheat and other farm commodities over the past five years has cut total U.S. farm income in half. Last week, the USDA said income from farming is expected to fall further over the next decade. Now, picking up work in construction or truck driving is required for many farmers to fund seed and fertilizer purchases, and keep current on loan payments for tractors and land. The Journal writers explained that, “U.S. food producers as a result are increasingly exposed to economic forces far beyond the fields. Many farms have become reliant not just on sales of crops and livestock, but on the health of rural businesses such as trucking companies and manufacturing plants. Those jobs have been slow to bounce back from the 2008 financial crisis. As of mid-2016, the number of jobs outside of metro areas remained 3% below their prerecession peak, while those in metro areas had grown 5%, according to federal data. The Journal article added that, “Larry Stenger, regional president at First Mid-Illinois Bank & Trust in Sullivan, Ill., said farmers in his region often use their trucking fleets for off-farm work in winter months, transporting grain for nearby elevators or hauling goods for other trucking firms. ‘There are opportunities out there for those looking for it,’ Mr. Stenger said.